Ellie Markovich, multi-media storyteller and Brazilian chef, carries a camera and recipes with her at all times, producing inspiring recipes for her website Story Cooking, and profiles of local food and cooks in collaboration with the Sanctuary for Independent Media. She is actively involved in the Capital Region community, conducting healthy-cooking, participative workshops with organizations like the Honest Weight Food Co-op, Denison Farm, and Capital District Community Gardens. 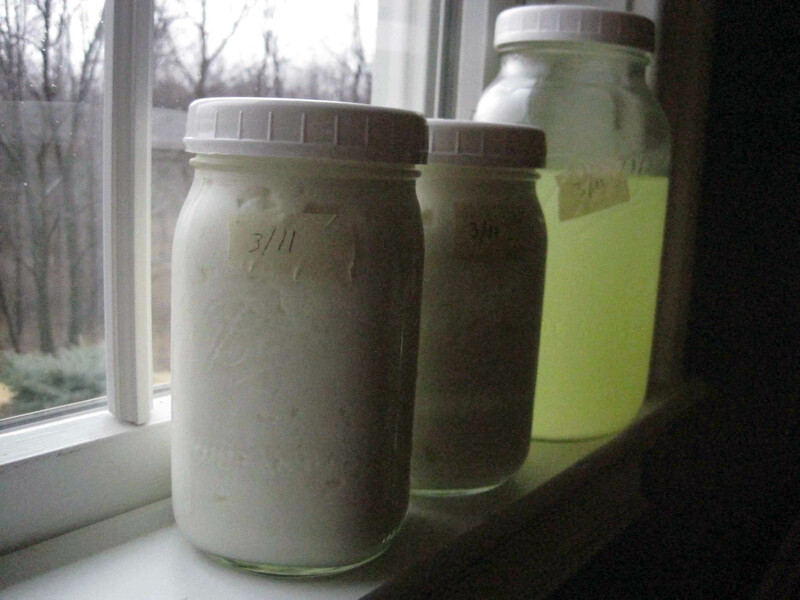 Mix 4 cups of Greek yogurt with 3/4 cup of maple syrup. Mix well. Chill the yogurt mixture and freeze in your ice cream maker according to the manufacturer’s instructions. Add 8 oz of plain Greek yogurt, to the milk mixing with a clean metal whisk, mixing well. Cover with a tight lid. Wrap your pot with a warm blanket and place in a cooler box for 12 hours. Strain out whey with a cheese cloth to desired consistency. Transfer to clean jars and refrigerate (makes 8 cups). As part of her job with the Agricultural Stewardship Association, Ellie Markovitch produced a slide show to capture the sights and sounds of the maple and milk tour at Cannon Cattle Ranch on March 10, 2013. 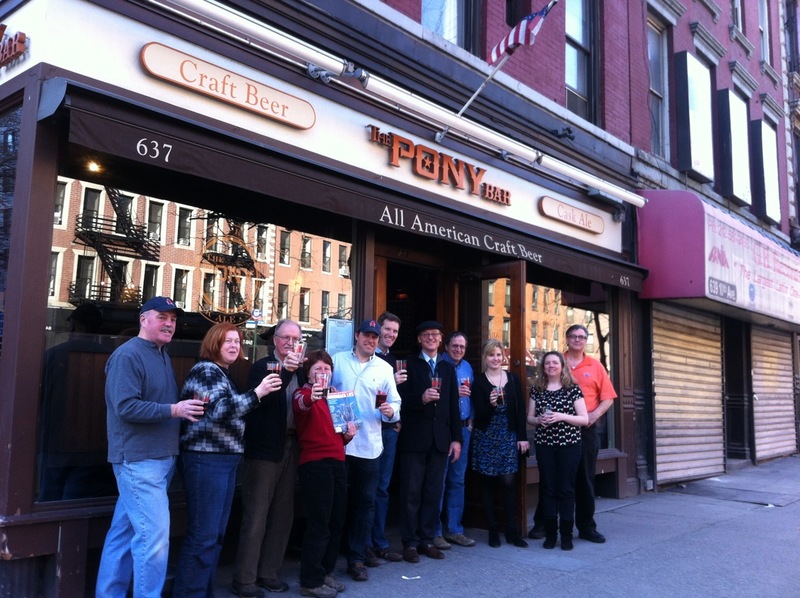 As a number of people ventured out into the New York sunshine to celebrate a spring-like day, the festive gathering at The Pony Bar included visitors from around the city and upstate New York, and even international travelers. While only 200 gallons were made, fans are all hoping for another round of production. Elizabeth (Betsy) Folwell, editor of Adirondack Life and husband Tom Warrington enjoy ‘Life Support,’ where staff at the magazine sourced the syrup from 12 producers representing the 12 counties within the Adirondack Park. In the North Country it’s time for liquid gold – throughout the Adirondack Park you’ll see sugar houses fired up to make maple syrup, the first harvest of the year. Used as a topping for pancakes and waffles, this popular sweetener has also found its way into ‘Life Support,’ a maple porter made by Lake Placid Pub & Brewery, a joint project with Adirondack Life magazine. Staff at Adirondack Life were inspired by “Keg Party,” a recent article about the local beer renaissance. They approached the pub’s owner Chris Ericson about a collaboration that would include maple syrup sourced from all 12 counties within the Adirondack Park in a seasonal, limited edition brew. Homestead Maple’s Scott Henze, a producer in Northville (Fulton County) was one of the 12 maple producers tapped to contribute to the inaugural run of the maple porter. Sometimes that means taking a trip from Hell’s Kitchen to Lake Placid. 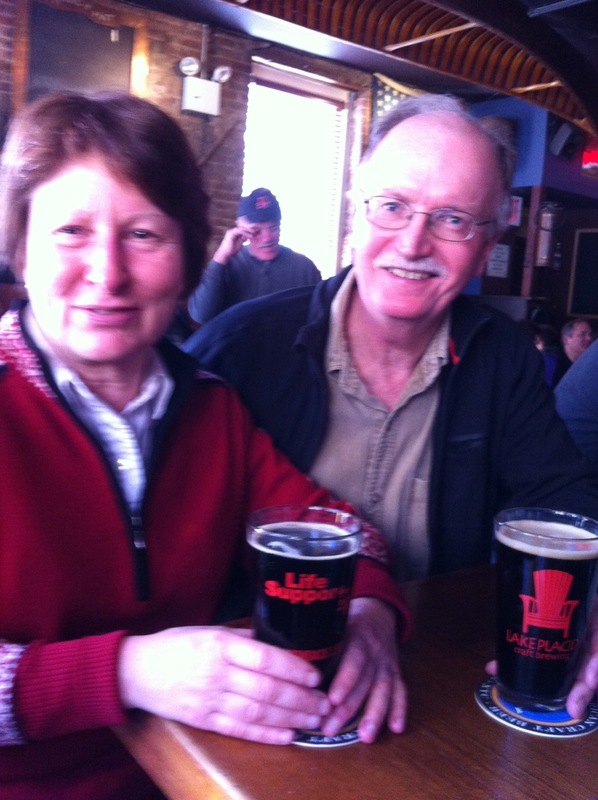 “It’s not uncommon for me to drive the 300 miles (one way) when there is a rare keg to be had,” McLaughlin says, as in the case of the ‘Life Support’ maple porter. Adirondack Life’s creative director Betsy Folwell and husband Tom Warrington, traveled from their home in the serene Adirondack community of Blue Mountain Lake to New York for the tapping of this special edition brew. The large group of people at the bar spilled out onto the city sidewalk at the corner of 45th Street and 10th Avenue – the first day of spring-like weather combined with the flavor of the first sweet harvest of the season. If you’re not able to taste this year’s ‘Life Support,’ there are other ways to join in the upcoming maple festivities throughout New York State – visit www.mapleweekend.com. More than 250,000 gallons of maple syrup are produced in New York state each year making it the second largest maple producer in the country (New York produces about 17 percent of all US maple syrup). Late winter, when daily temperatures reach the 40’s and nightly temperatures fall back below freezing, is the ideal time to tap maple trees. Every year in February more than 1,500 farmers in New York tap their maple trees and begin the process of collecting maple sap which is later gently boiled down into the sweet amber syrup that we put on waffles. Forty gallons of tree sap is reduced through the boiling process to produce one gallon of maple syrup. On its own, Maple tree sap has a two percent sugar content. When the boiling process is finished maple syrup will be about 66 percent sugar. 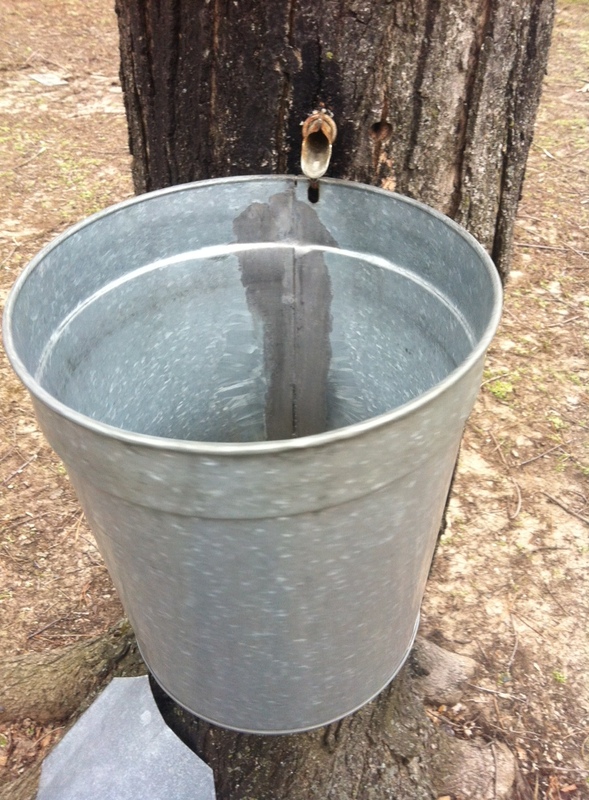 The maple syrup process begins with the tapping of the trees. Half inch holes are drilled about three inches deep into the maple trees and a spile (a spigot -like device) is tapped into the hole. A bucket is hung below the spile to collect the tree sap. Some farmers use plastic hoses that connect several trees to a central collection tank. After the the sap is collected, it is taken to the sugarhouse where the boiling process happens. Some sugarhouses are true to the historic sugaring process and employ large cast iron kettles to boil down the sap. Most contemporary sugarhouses use large rectangular steel tanks that are heated from underneath. Today many maple syrup producers use reverse osmosis to remove 75-80 percent of the water from the sap before it is further boiled down to syrup. The advantages of reverse osmosis include the reduction of energy consumption and minimized exposure of the syrup to prolonged periods of excessively high temperatures. When the maple tree sap is finally boiled down to maple syrup, it can be boiled down even further to make maple sugar, maple candy and maple taffy. More moderate levels of boiling are used to create products like maple cream, which is softer and less granular than maple sugar, and maple butter which has a creamy, slightly thick and spreadable consistency. Syrup quality is graded according to its flavor profile and its color. Some common background flavors that occur include molasses, vanilla, caramel, chocolate, and coffee. Occasionally woody, fruity and floral flavors are present. 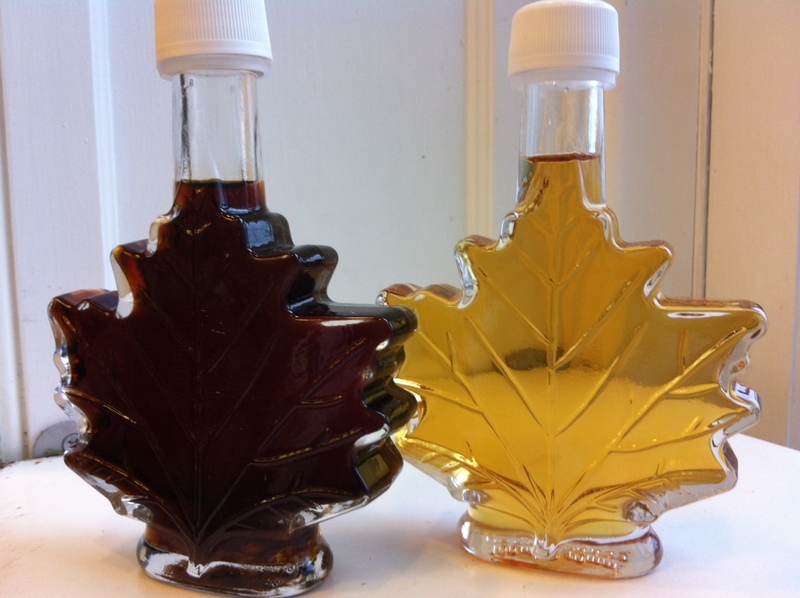 The individual flavor of maple syrup depends very much on how and where the maple trees are grown. A Light Amber – the lightest color, mild and delicate flavor. A Medium Amber – slightly darker than A with a fuller flavor. A Dark Amber – The darkest of the three grades. Also has the strongest flavor. Extra dark (cooking) – darker than the grade A flavors also known as US Grade B. Store unopened maple syrup in a cool dark place. Once opened, maple syrup should be stored in the refrigerator. In most recipes that call for sugar, maple syrup can be substituted for all or part of the sugar. Reduce the liquid in the recipe by 3 tablespoons for each cup of syrup. Tapping maple trees does not damage the trees and only about 10 percent of the sap is collected from the trees each season. A sugar maple tree is typically about 30 years in age and about 10 inches in diameter before it is tapped for syrup production. Depending on its size, maple trees can be tapped in multiple places. Each tap yeilds about 10 gallons of sap. In a small mixer, mix the ingredients until the dough is pliable and can be rolled to form shapes. Roll small balls between the palms and place on a baking sheet lined with parchment paper. Gently flatten the balls with the palm of the hand. bake in a 300-325 degree oven for 5-7 minutes until the edges just begin to turn brown.